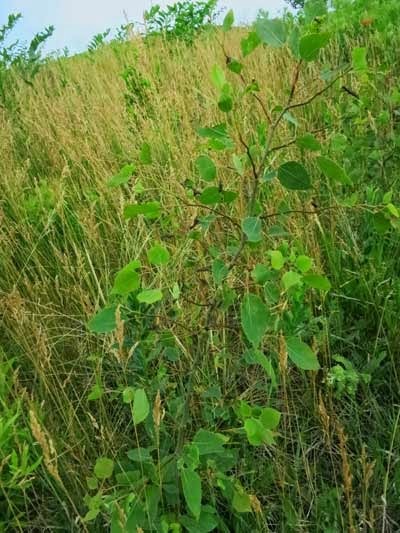 Sweet clover: why is it so prevalent on our prairies? Sweet clover (Melilotus alba; M. officinalis) is probably the most expensive weed that we deal with in prairie restoration work. 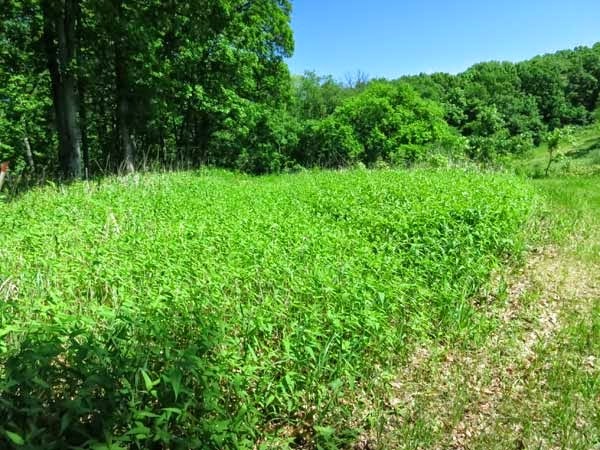 In contrast to garlic mustard and reed canary grass, the control cost per person hour per acre is quite high, and most infested areas are almost impossible to eradicate. The principal reason is the historical legacy of former sweet clover agricultural use. As part of my interest in historical ecology I dug into the early agricultural literature on sweet clover. Sweet clover is native to Central Asia but has spread around the world. The Greeks wrote about it and it has been in Central Europe since the Middle Ages. It spread to North America in the 1600s. (One of the early ways it arrived here is in soil used as ship ballast.) Although an agricultural crop, it spreads well on its own and in the late 19th Century it was extensively present on roadside, waste lands, and other disturbed areas. In fact, it was so prevalent that in 1893 it was declared an “official” noxious weed in Wisconsin and Illinois. However, many farmers objected to calling it a weed and a love/hate relationship soon developed. 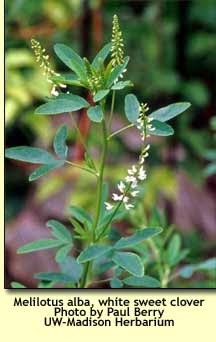 During the period when sweet clover was widely used, it readily “escaped” and moved not only into roadsides and waste lands, but sunny natural areas such as prairie remnants. It is important to note that sweet clover will only grow in soils with pH 6.5 or higher. This means that for agricultural purposes it often needs lime. In many areas of Wisconsin, especially in the Driftless Area, sandy soils and those that have developed on sandstones (such as St. Peter Sandstone), are too acidic so that they will not support prolific sweet clover growth. Thus, sweet clover may not be a problem in all prairie remnants. Today, whenever a prairie remnant is restored in our area, fire is one of the first tools that is used. Although fire is obligatory for prairie restoration, it also induces sweet clover seeds to germinate. Especially after the first burn in virtually any remnant, there will be a major “flush” of sweet clover plants. Although these new plants can (and must) be eradicated, they are an “indicator” that likely sweet clover once flourished in this site and left a seed bank that has the potential for lasting many years. If such a sweet clover flush occurs, it guarantees that the restorationist is at the start of a lengthy task. How about former agricultural lands? It depends. Some of these fields may have been used to raise sweet clover many years ago, and viable seeds may still be present. 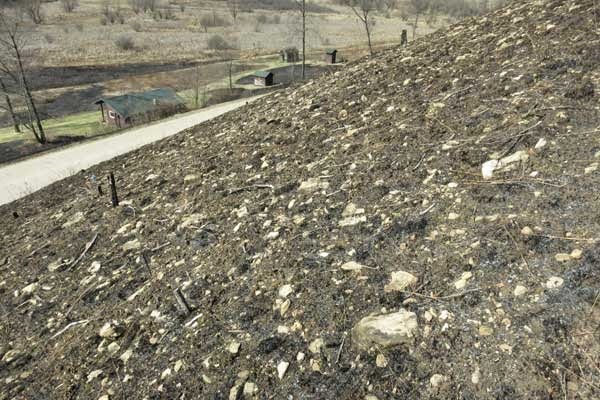 Although most of these seeds may be well below the surface, scattered seeds may be near the top and may be induced to germinate by prescribed burns. Although sweet clover will likely not be a problem, this is not guaranteed, so that any planted prairie should be monitored. Even without fire, it is inevitable that some buried seeds will germinate. However, it does seem probable that sweet clover eradication will be easier in former agricultural fields than on remnants. On Saturday, June 21, 2014, a butterfly field trip (24 participants) was held at Pleasant Valley Conservancy led by Ann Thering and Kathie and Tom Brock. This trip was held under the auspices of the Prairie Enthusiasts, Madison Audubon Society, and the Southern Wisconsin Butterfly Association. This was the fourth year this trip has been held and it is almost becoming a "regular". We are pleased that Pleasant Valley Conservancy has become a great site for butterfly conservation. Due to time constraints, only the wetter areas of the Conservancy could be visited. Thus, species found primarily in the oak savannas or dry prairies are probably missing from the list below. The count was provided by Ann Thering. 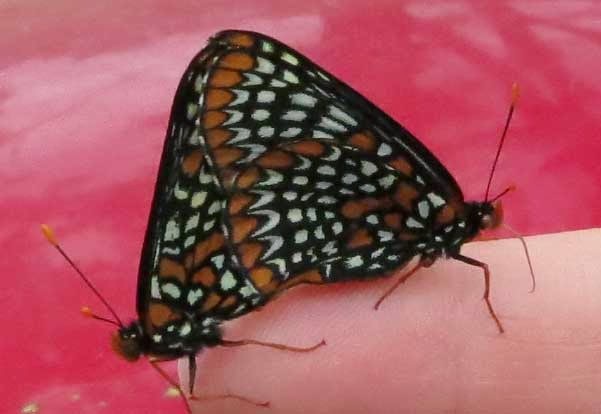 The Baltimore Checkerspot is one of the species of most interest, since it is not that common in southern Wisconsin. As the "count" shows, Pleasant Valley Conservancy is a great site for this species. The photo shows a "tame" mating pair of this small but attractive species. Wood lilies are blooming now but you have to be quick or you will miss them. This year we have been more successful than usual at Pleasant Valley Conservancy. They are/were flowering in Valley, Pocket, and Toby's Prairie. With their brilliant orange-red color they really stand out against the green prairie background, although we sometimes mistake a colored flag at a distance. This is the first year we have seen them at Toby's Prairie, where they were planted as seed. Kathie's trick for seed planting is to knife the seeds in with a small butcher knife. She cuts a narrow trench in the soil, adds a couple of seeds, and closes up the hole. If you are lucky you may see a flower in three or four years (or never). Since wood lilies make bulbs, they may return to the same site again and again. However, our experience at Black Earth Rettenmund Prairie is that the flowering population varies widely from year to year. Because of the 2012 drought, 2013 was a really bad year, but 2014 is lots better, although not up to some of the peak years. 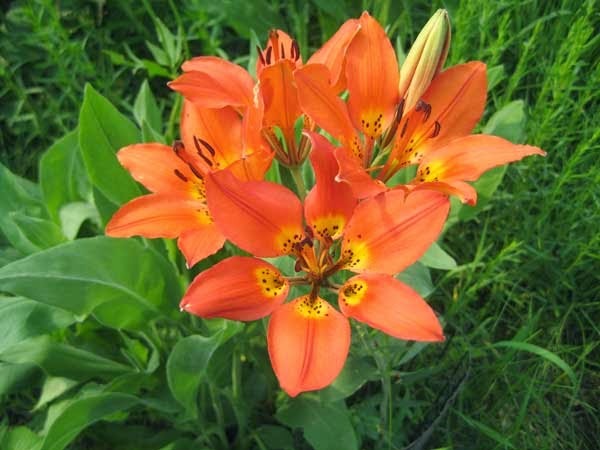 See my 2008 post for some details on why this site is so favorable for lilies. Even years after an aspen clone has been eradicated by girdling, scattered root suckers may appear. 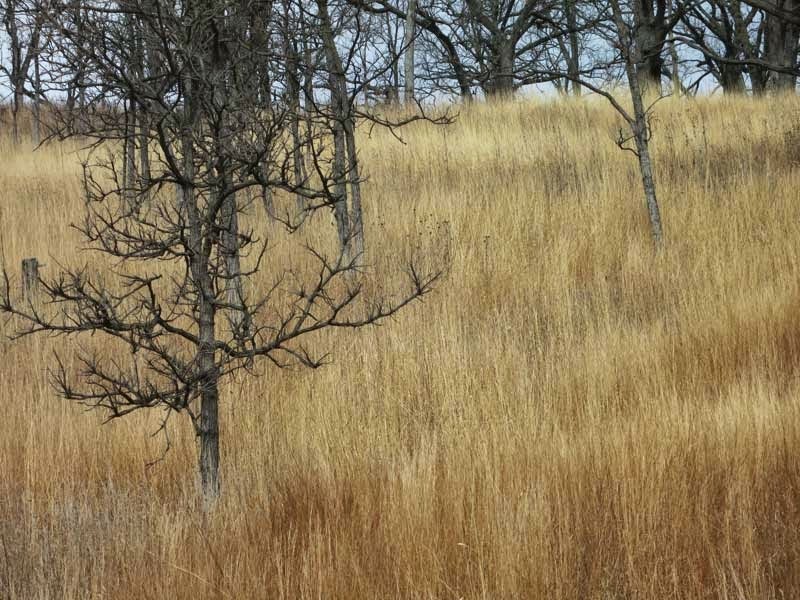 For instance: the big aspen clones at Black Earth Rettenmund Prairie were eliminated in 1986-1987, yet in 2012 we had quite a few new shoots. There isn't any seed bank, so these shoots have presumably arisen from underground rhizomes that have reawakened after many years of dormancy. You can't really ignore them, as they have the potential to turn into aspen trees. But the technique for getting rid of them is different than what you use on the trees. Fortunately, these suckers are very sensitive to herbicide, and basal bark with Garlon 4 in oil works magic. The paint stick works very well, and a swipe at the bottom of each stem will kill it. An alternate is to spray about a 4-6 inch strip up the base of each stem, using a hand spray bottle. Either method is quite economical of herbicide and damage to nearby good plants should not occur. (I killed two aspen stems with no visible effect on a flowering wood lily plant that was less than a foot away!) I don't recommend using a backpack sprayer instead of a hand spray bottle, as it uses a lot more herbicide and can potentially cause peripheral damage. Early June is a good time to canvas an area for aspen suckers, because they are easy to find. The photo below shows a fairly typical patch of aspen that it took about 10 minutes to treat. Small aspen plants that were treated abut 2 weeks before with Garlon 4 basal bark. The herbicide mixture we use is 20% Garlon 4 (one part Garlon 4 and four parts bark oil). You can purchase Garlon 4 at almost any agricultural co-op, and the co-op should also be able to supply a suitable oil. The GIS-based map above shows the distribution of two invasive species that are especially difficult to get rid of. We learned how to get rid of sumac and it is mostly gone. Woodland sunflower (mainly Helianthus divaricatus) is another problem. Although we have found some techniques that work, it spreads so fast that we can't keep up with it using our limited resources. 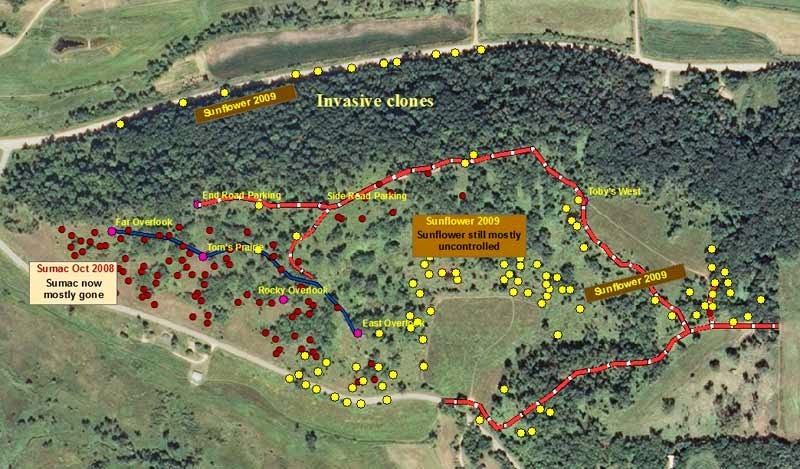 The map above shows the distribution of woodland sunflower when we first started to work on it, in 2009. Marci and Amanda did the survey in August 2009, when this species is easy to recognize because it is at peak flowering. Each clone was located by GPS and entered into an Excel spreadsheet. There were 95 clones, with wide variation in size. I chose some of the smaller clones for experimental work, and was able to eradicate them. (More on that in another post.) However, many of the clones were too large to eradicate. The photo below shows the extent with which this species has spread in our fine White Oak Savanna. Where the dense patches are present no other plants are growing. The area seen here once had fine populations of cream gentian and Culver's root. Woodland sunflower spreading widely in the White Oak Savanna (Unit 12A). This photo was enhanced in Photoshop to bring out the color of the patches. Almost everything that is lighter green is sunflower. I have also seen this same species in other nearby sites. In fact, it has invaded the planted prairie of one of my neighbors. We have had it invade several of our planted prairies, moving out of nearby savannas. The photo below shows it growing out of an oak woodland into a nearby field. Woodland sunflower spreading out of an oak woodland into a surrounding field. Lately I have been using the Internet to find photos from various sites showing monocultures of woodland sunflower. 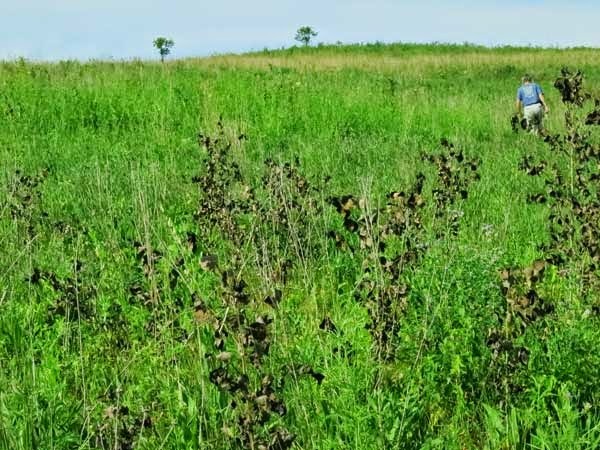 Recently there was a photo of sunflower taking over and destroying the diversity of Vestal Grove, a classic oak savanna restoration in the Chicago area. The managers were wondering whether they ought to do something about it. Yes! A brief search of the Internet will reveal that sunflowers in general, including this species, are allelopathic and produce toxins that will kill (or prevent the growth of) other species. They are also autotoxic and inhibit their own growth, so that the center of a clone may be partially bare. However, according to my observations, they don't eradicate themselves, since they are always growing further and further away from the toxic zone. 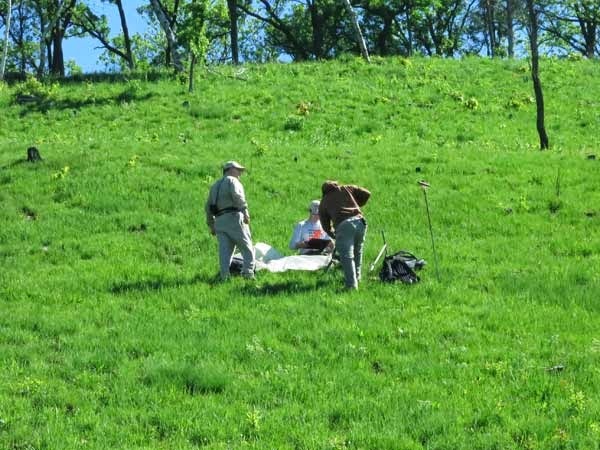 Last Tuesday we had a visit from USDA-NRCS soil scientists who are doing a detailed study on soil/plant relationships on bluff prairies in the Driftless Area. This project, under Soil Scientist Peter Hartman, is correlating soil characteristics of bluff prairie plant communities in Wisconsin, Minnesota, Iowa, and Illinois. Our site was selected as one of a number of Wisconsin State Natural Areas. Kathie and I were happy to contribute our small bit to this extensive research project. We always learn something which has the potential to help us better manage our restoration work. I was especially interested in the nature of the soil on this bluff prairie. The first photo below shows the lush vegetation on the day of sampling (about two months after the spring burn). Although right after a burn the soil surface (middle photo) looks very bare and rocky, the NRCS researchers were able to easily dig a sampling pit. Also, the long metal probe seen erect at the right side of the top photo could be pounded (with force) all the way to the hilt (at least 7 feet). Thus it is understandable that the prairie grass roots can grow deep into the terrain and obtain moisture. The rocky terrain in the photo below is typical of the south-facing slope of our bluff prairie. I had always assumed (erroneously) that the soil depth here was very shallow. Typical rocky soil on the south-facing slope. Photo taken the day after a spring burn. Given the depth of the soil, it is reasonable that the grasses grow tall and lush. Lush tall grass typical of the bluff prairies. The species are principally Indian grass and little blue-stem. We look forward to receiving the final report from this interesting study. The bird count this year was done by Ben Winesett, a volunteer from Mt. Horeb, supplemented with additional species by Susan Slapnick. The total count is 72 species. Ben's count was made on May 18 when there were still a lot of migrants. Breeding bird counts done in previous years by Roma Lenehan can be found at the following link.